While many of Indiana's summer birds are migratory, a few key species stick around when days turn cold and snow starts to fly. It's not uncommon to peek out your window and see a red cardinal perched on the snow-covered branches of a pine or an American goldfinch trying to sneak seeds from your feeder. When trying to ID your feathered friend, note his size, marks and any other notable characteristic. Winter raptors who inhabit Indiana include Cooper's hawks, red-tailed hawks and American kestrels; common Indiana winter owls include great horneds, barreds and eastern screeches. Several smaller birds stick around during Indiana's cold winters, as well, including snow buntings, dark-eyed juncos, song sparrows, purple finches, siskins and nuthatches. Waterfowl including Canada geese, greater white-fronted geese, swans, mallards, teals and ruddy ducks inhabit Indiana wetlands and meadows even when snow is on the ground. Looking at a bird's field marks can help you identify the specimen. Take note of any distinguishing markings the bird has. Examples include wing bars, eye rings, colored caps and cheek patches. Also take note of the color of the bird. The familiar blue jay could be described as bright blue above and white underneath, with black markings along his cheek and bill. A male robin might be described as deep red all over with a black mask. A red-headed woodpecker's red head, black back, white-tipped wings and lighter underbelly would be among his identifying field marks. A screech owl's identifying marks would include the white X mark on his face, black stripes and an overall brown color with white markings. Another important feature for discovering which winter birds are at your feeder are their sizes and silhouettes. Chickadees and house sparrows, both common throughout winter in Indiana, might be described as tiny, round birds. Crows, on the other hand, would likely be described as large birds with long tails and strong beaks. You might describe the eastern bluebird as a small bird with a short bill and rounded head. 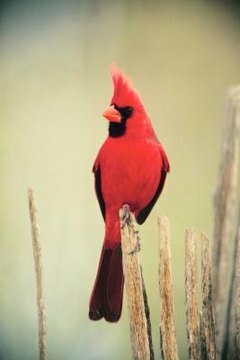 Take note of the crest of a crested bird, such as the cardinal and the blue jay. The blue jay has a stiff, pointed crest. Note whether the tail is narrow, as in many wrens, or notched, as in the song sparrow. Watch birds' behavior as they flit about. Some birds will jump along the ground, landing in low branches of dense shrubs. Others will peck through the snow looking for fallen seed; still others may fly among the top branches of snow-covered trees. Some birds are much more active than others, even in winter. For example, blue jays may be bosses of the bird feeder, but in many cases you can observe them studying their situation. Goldfinches will fly quickly from feeders to nearby branches. Nuthatches will hop up or down the trunk of the tree using their powerful feet to keep hold of the bark.